Endoscopy is the gold standard for detection of early cancer in the gastrointestinal tract; it is approved for gastric cancer screening in Japan and South Korea and for colorectal cancer screening in many countries worldwide. A rationale is the strong reduction in the incidence of colorectal cancer after 10 years’ follow-up of colonoscopic screening with resection of all neoplastic lesions. High-risk groups are subject to different, more frequent endoscopic surveillance programs, which are summarized for esophageal, gastric, and colorectal cancer. 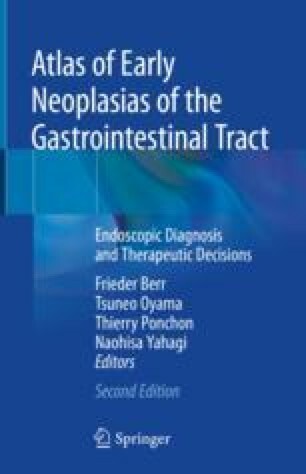 The chapter explains the preparation and procedural steps of screening colonoscopy and esophago−/gastroscopy, including benchmark criteria for quality of endoscopy. GLOBOCAN database, International Agency for Research on Cancer, WHO, http://globocan.iarc.fr/.